Today's VETgirl online veterinary continuing education blog is by Dr. Catherine Lenox, DVM, CVA, DACVN, a nutritionalist at Royal Canin USA. Need help interpreting a dog or cat food label for your pet owners? Get some great tips below! What basic information is required to be on a pet food label? What information is required in the guaranteed analysis? Also, product claims such as “low fat” or “contains glucosamine and chondroitin” have to be substantiated on the guaranteed analysis, so you may see maximum percent fat, or amounts of nutrients not typically in a guaranteed analysis such as glucosamine, chondroitin, omega-3 fatty acids, or other nutrients. How are pet foods analyzed for the information in a guaranteed analysis? Most companies that just do a guaranteed analysis will do something called a proximate analysis. Proximate analysis represents an estimation of nutrient content and measures percent moisture, crude protein, crude fat, ash, and crude fiber. Carbohydrate content is then calculated by subtracting these 5 measured nutrients from 100%. Companies that do an in-depth analysis of nutrient content will provide what’s called a typical analysis, which is the actual average nutrient content over multiple analyses, versus maximum and minimum percentages. Companies that do a typical analysis may provide this information in a product guide or on their website, or you may have to call the company to get that information. How do I compare the guaranteed analysis of one food to the guaranteed analysis of another food? The guaranteed analysis is in percent as fed, which means that the food contains water when the diet is analyzed. When you want to evaluate the fat content in the guaranteed analyses of different diets, comparing one value on an as fed basis to another is like comparing apples to oranges, due to the differences in moisture content of different diets. Therefore, I recommend converting the nutrient on an as fed basis to dry matter basis, which factors the water out of the equation. Converting the nutrient maximums and minimums in a guaranteed analysis to dry matter basis allows one to compare any food in any form to another food. You have a canned food with 5% minimum crude protein and 75% maximum moisture. 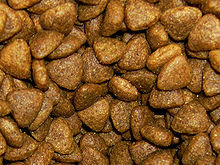 You have a dry food with 20% minimum crude protein and 10% maximum moisture. What are other ways to express nutrient composition of pet food? How does a company ensure a pet food is nutritionally adequate? How do I tell if a food is nutritionally adequate for my patient? The nutritional adequacy statement is a label requirement. It will indicate what species and lifestage the diet is intended for and how it was ensured that the diet is nutritionally adequate. What is an AAFCO feeding trial or “animal feeding test”? The animal feeding test is one way to ensure nutritional adequacy of a diet. Feeding tests are expensive to perform and have to conform to specific guidelines in order to be mentioned in a nutritional adequacy statement. Many companies will perform their own feeding trials that do not exactly conform to AAFCO standards and will not indicate on a bag or can that these tests were performed. The feeding tests are useful information but there are some limitations to the protocols. For example, for canine adult maintenance, only 8 dogs have to be enrolled in the 26 week feeding test, 6/8 have to finish, and the only parameters that are required to be measured include hemoglobin, packed cell volume, alkaline phosphatase, and body weight. A diet fails the feeding test if the dogs or cats show abnormal blood work (based on the parameters mentioned and, in addition, taurine for cats) or clinical signs of nutritional excess or deficiency, if any individual dog or cat loses more than 15% of its initial body weight, or if the dogs or cats average greater than 10% weight loss.